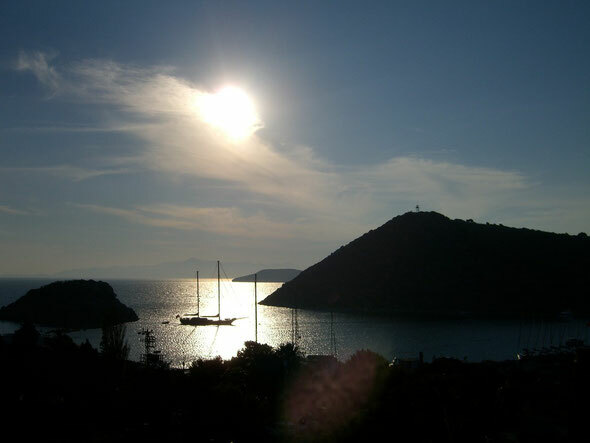 Gümüslük – by German sailors often lovingly named „Gemüseglück“ – is apart from the antique harbour of Knidos (peninsula of Datca) one of the most favourite sailing destinations of the Aegean west coast of Turkey. As it is intended to leave everything there quite natural, the bay offers only alimited wooden landing-place for goulets and yachts. When entering the bay you keep near (not too close) to Rabbit`s Island. On the left side an antique mole blocks up the way! Take care! Shallows caused by moles even after a concrete landing–stage! You cast the anchor best amidst the bay. Be careful, the anchor sometimes comes off!